I’ve developed a bit of an aversion to the idea that Qi (ch’i) or Qigong (ch’i kung) is magic. I think that something as old as Qigong, or as natural as Qi, is no more magical than life itself. Now it’s nice to be in awe of life and nature, but I find it more useful to be grateful and respectful. To me, something real can be magical only as long as it’s a novelty. Yes, childbirth is a miracle, magical, but you might get two different opinions from a first-time pregnant mom-to-be and a mother giving birth to her seventh child. Also, being in awe of something distances us from it. Along those lines, a friend of mine once referred to specific artists and writers as “gods”. Given that my friend is extremely intelligent, dynamic and creative, I felt that he was selling himself short, and if I recall, I told him so. As long as he thinks of these men as gods, he’ll never be as good as them. However, if he sees that they are just men, possessing talent and perseverance in some measure, he’ll see that their accomplishments are possible, given an adequate mix of talent, perseverance and luck. If you’ve ever gained new abilities such as those that derive from an increased level of fitness, you’ve found that tasks that might have seemed beyond your reach are now possible, or even trivial. You probably don’t feel like a super-being — things are just easier, as if that ability were always there. Those stairs don’t seem so high. The walk seems shorter. And Qi is like that. If we think it’s magic, we might never embrace it, and if we do encounter Qi, we might not believe it. If we think it’s a natural part of life, we’re more likely to embrace it and learn to use it. And it will seem quite natural, as if it were always there. So what do I think Qi is? I think it’s the thing that drives natural processes, such as blood circulation or muscular movement. We see it by studying those processes, not unlike the way we study wind forces by measuring the movement of air. The Chinese say that the Yi leads the Qi. This means that by concentrating the mind (Yi), we can increase the amount of energy (Qi) in a part of the body. It is the mind that moves the limbs, but also the mind that makes us sick or dizzy. Imagine your greatest fear, and check in with your physical response. Me, I imagine standing on the edge of a great precipice, and my body often reacts the same way whether I’m there or not. Now … can we send Qi across a room? Does it flow down streets and stagnate in a bathroom with bad Feng Shui? I don’t know. One thing at a time. If, under favorable conditions, I can turn my hands pink by concentrating my mind, I’m happy for now. It was a tasty treat, and it’s still a tasty treat. Practically speaking (and that’s all that matters to this blog), it’s nothing more. If we need the benefits of the flavonoids without the fat & sugar, we should talk to our doctor or a nutritionist about options. This brings to mind one of those little master-student stories. The student travels a great distance to learn Tai Chi from the master. He is granted an audience, approaches the master and with great enthusiasm, says: “Master, I desire to learn Tai Chi. I will work very, very hard at it. Tell me, how long will it take to master the art?” The Master replies, “ten years”. The student desperately pleads “but Master, what if I put my heart and soul into it, concentrating as hard as possible, infusing Tai Chi into my very being with great effort?” The Master replies, “twenty years”. I’ll bet you’ve never heard that one before. The point is, Tai Chi is about yin and yang. Making things happen and letting things happen. If the student is all about harder, harder, harder, that’s all yang yang, yang. How will the student know soft? How will the student know yin? The way to practice is practice often, practice with awareness and intention, but practice gently in order to keep our mind open, able to accept new things, things we didn’t expect to find. If we’re bogged down with expectations, we will only find what we expect to find. 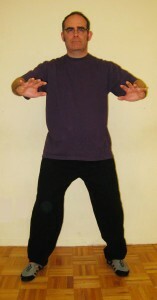 Most students go through a series of stages as they progress in their Tai Chi practice. This is my current impression of the order of the stages, which may be revised at any time. The order of the stages is also fluid, with students flowing in and out of a stage at different points in their progress. Stage 1: gentle movement. At this stage, the students go through the motions pretty much like a slow-motion dance. At first, they may feel awkward, but eventually become accustomed to their own interpretation of the motions and postures of the set. Stage 2: relaxation. Once the students have an idea of which moves come next and how they want to perform the moves, they begin to actually enjoy doing the set and begin to relax as they do the slow-motion dance. It would be great if the student started practicing on his/her own at this point. Stave 3: correction of structure. If the students continue to attend class, they will no doubt receive some correction from the instructor regarding their movements and postures. This is not meant to bring the appearance of the student’s performance closer to that of a particular master, but to help the student feel more connected while practicing. Usually these corrections teach the student to move from his/her core, to connect body parts through roundness and to remove extraneous motions. Stage 4: internal sensitivity. Given that how the students feel is more important than how they look, at this point they need to evaluate their own postures and movements through increasing proprioception, or internal sensitivity. The students learn to better sense where their weight is, to sense whether they are moving limbs in isolation or in concert with the body core, or to sense where they are keeping tension in their body. More advanced stages will be covered in a future post. Greetings, all and thanks for coming. I expect to write about Tai Chi, Lok Hup, proprioception, connectedness, relaxation, energy, health, fitness as well as things related and unrelated. It’s a work in progress here, so please bear with me as I discover the ins and outs of blogging with WordPress.